This reflective ballad with a mainly piano based accompaniment shines light on the perennial plight of the poor in developing countries who face flooding , drowning , loss of property and often death after sometimes relatively very minor rainfall. 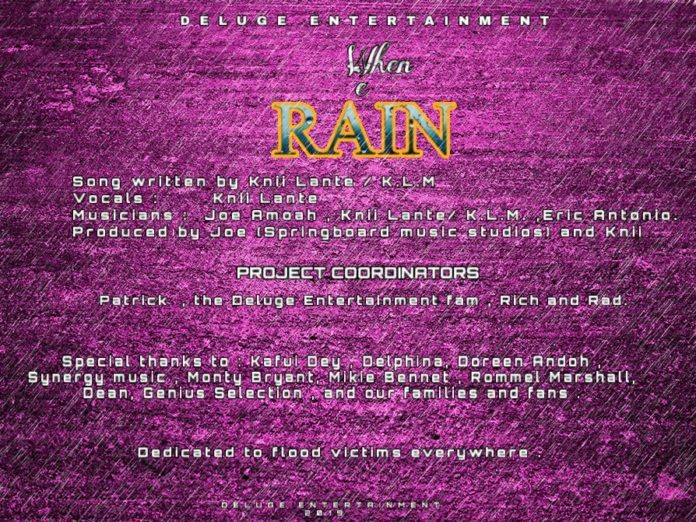 Under his management team of Deluge Entertainment and with the support of Rich & Rad this is a song sang in tribute to the flood victims in recent Accra floods and the victims of floods everywhere especially in the motherland ( Africa ). Says Knii ….” often when it begins to rain , that is the time when privileged families sleep the most in their cosy houses ; that is the time when lovers cuddle together in their warm beds ; we easily tend to forget that just across town is a different society with a different experience …. indeed that is the time when the masses of our people have to wake and stand up in corners , bail out flood waters entering their rooms , and deal with lost property and lives …. sad .